Whether you do it yourself or hire a professional landscape designer, you still have to come up with a plan for getting your landscape the way you want it if you’re planning on making changes when the weather here in the Twin Cities warms up. You just want a well thought-out, timeless landscape once winter is over, which makes winter the perfect time for thinking of how to place everything. Now that you’ve got some time before work can begin, it’s a good opportunity to get a draft of what your yard is going to look like once everything is finished. This will give you an idea of whether or not this is something you want to go with. 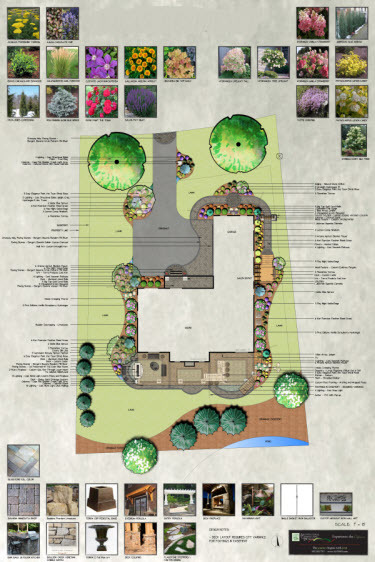 A good landscape design plan will have every detail outlined in the plans so that nothing is left out. There are plenty of landscape design ideas floating around the internet, but your best bet is to work with a landscape designer to make sure that the concept you like will actually work for your property. One thing that is usually always done when it comes to landscape designs is incorporating natural elements throughout the plan. Plants and shrubs or trees almost always are used. Plants and shrubs that provide color throughout every season can be added to ensure that you get beauty year round. (Yes, there are even options for adding color in a Minnesota winter.) Fragrance from these blooming plants can also be a perk of adding them to your landscape design. We can suggest a wide variety of different annual and perennial flowers that can provide this for you. There are other elements to be considered as well, especially the living beings that will use the yard. That means you and your family and guests, as well as animals if you’ve got them. If you have pets, you want a landscape design that works well for them. You do not want anything toxic, but something that is pet-friendly and will not get ruined by having animals in the yard. Make sure you’re taking Fido into consideration as you plan a maintenance-free landscape, for instance. While you may want to cut down on your lawn chores, you probably won’t want to completely eliminate grass if you’ve got a dog. There is no better way to get the right design for your property than to be able to confide in an experienced landscape design. specialist that knows what they are doing. At Architectural Landscape Design, we pride ourselves on being able to bring our clients’ dreams and visions to life. No matter what your property looks like now, we can work with you to come up with something unique and beautiful. We’ll work with you from start to finish, and and even fill in those blurry lines that you might be coming across for your landscape. We may suggest special features you haven’t considered and when the planning is done, come spring time, we can make that design become a reality for you with our professional landscaping installation. This is one of the best ways to go about designing your landscape and making it look perfect. Now that you’ve got some time on your hands to dream, give us a call and speak with one of our Minneapolis landscape design professionals. Find out how we can help you make the most out of the design that you’re envisioning. Then after the snow melts, we’ll get right to work and bring your winter landscape dreams to life. Call us at 952-272-7712 to schedule a consultation.